This entry was posted on 4th June 2018 by The Salon Look Girl. I love sleep. It’s true…I’ve never been one of those people that can survive on 6 hours a night. I need at least 8 hours or my brain and body will hate me for the rest of the day. For the most part, I’ve always seen the benefit of a good night’s sleep. These days though, thanks to technology, we’re increasingly interconnected and constantly ‘switched on’, so we try to survive on as little as possible. Big mistake, huge. The hours that we spend asleep are actually among our most constructive. While we sleep our brain recharges and cellular repair increases, which hugely benefits our skin. Your mind and body enter a biological regeneration mode while we sleep, performing reparative functions that don’t occur while you’re awake. Your skin follows a similar regenerative process. Sleep inducing melatonin is known for its antioxidant properties. Levels of stress hormone cortisol also fall while you sleep, allowing skin to repair and protect itself from outside damage. Sleep also gives time for your body to produce more collagen, which minimises fine lines. If that wasn’t enough, your body releases growth hormones while you sleep which can strengthen skin. That’s why sleep deprivation can be such a killer for your skin. Just a couple of nights of missed sleep can result in sallow skin, puffy eyes. If you keep that up, you’re in for dark circles and early ageing. 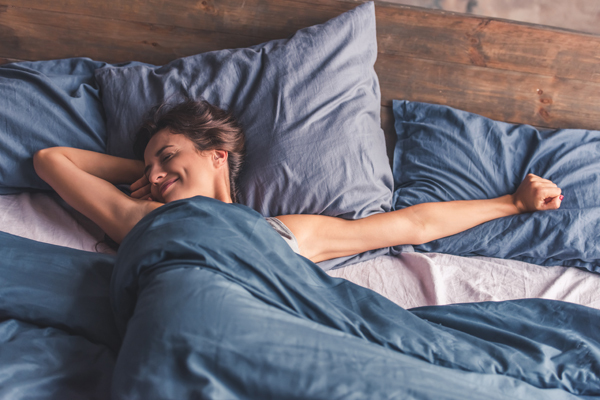 Your body is really working its magic while you sleep to keep your skin in top condition, but there are things you can do to help and maximise the benefits for your skin. Like we said, your skin is in repair mode while you sleep. The increased blood flow means your skin is best able to absorb active ingredients more effectively while you sleep. For example, if your skin’s dehydrated I would always recommend a gel-cream formula for your night cream, as this will help to replenish hydration levels. Try Thalgo Source Marine Hydra Marine Gel-Balm. This hydrating balm has a delicious gel texture, offering a triple anti-fatigue performance for a radiance boost. If we’re getting serious about active ingredients though, essential oils are the best solution for a night time routine. Plus, they have the added bonus of relaxing the mind and body to help improve sleep quality. Lavender is a well known scent to aid sleep, but it’s skin benefits as an essential oil are proven too. Decleor have long known about the link between sleep and skin health. Their range of night balms are specially formulated to work at night when the skin is most receptive. Their sensual and aromatic balms, such as Decléor Aromessence Iris Rejuvenating Night Balm relaxes the senses before sleep and has a heavenly melt-in texture allowing it to be rapidly absorbed. It intensely moisturises and comforts mature skin to leave it energised, toned, with facial contours redefined. So take the time to switch off, and let your skincare work for you while you get a good night’s sleep.